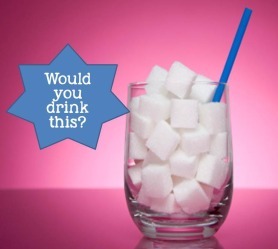 Would your students drink a glass of pure sugar? Probably not, but they have no trouble drinking sugary beverages by what seems like the gallon. Students are not always aware of the amount of sugar they are consuming or the health effects associated with too much sugar. In this lesson students will discover the difference between natural sugar and added sugar, the common aliases of sugar used on nutrition labels, and the health issues associated with consuming too much, while also investigating the amounts of sugar found in the common beverages they consume on a daily basis. 11.3.9 D Analyze relationship between diet and disease and risk factors (e.g., calcium and osteoporosis; fat, cholesterol and heart disease; folate and birth defects; sodium and hypertension. 11.3.12 C Evaluate sources of food and nutrition information. Ask students to define the term sugary drinks. They will see how that compares with the actual definition in the web activity they will complete later. Break students into small groups and give them a bag of beverages. Each bag will include a fruit juice drink, a soda, a sports drink, a sweetened iced tea, and water. Have groups, using the front of the label only rank themselves from least amount of sugar to the most. Take a picture of their ranking for later use. Place beverages back in bag for later use. Assign students the “Sugary Beverages” web-activity to learn more about sugar consumption from beverages, the difference between natural and added sugars, the aliases of sugar, and the health issues associated with drinking too much. The following activities reinforce the concepts discovered in the web activity website. In their small groups, have students go back to their bag of beverages and complete the “Investigating Beverages” activity and data sheets. This is where students may need to reference the picture you took early in this lesson. Discuss reactions to the amounts of sugar in their beverages, what surprised them and how much their pre/post ranking of beverages compared. After illustrating the amounts of sugar and aliases found in their common beverages, I like to show students this YouTube clip titled “Sugar is Killing You” explaining why sugar is so bad for the body and our health. Within the website activity there is a section titled “Did You Know?” that I like to use to reinforce why the intake of too many sugary beverages is serious to one’s health. I also like to conclude this portion by showing this YouTube video called “The Hidden Dangers of Sugary Beverages“. As a fun lab, I have students prepare a healthy fruit smoothie and then we analyze the amount of sugar found in them compared to the beverages they analyzed for their project. For their project I assign them a “RAFT Advertising Project” where students have to use all of this information together to create a magazine or television ad that encourages teens to decrease the amount of sugary beverages they consume. See guide sheet for criteria. Note: You may have to review the advertising techniques before assigning this project. Here is a sample ad that I show them as well. Have students present their ads via the document camera or the projector depending on which ad they made. what became of the website sugary beverages? what became of the website sugary beverages? The following activities reinforce the concepts discovered in the web activity website. Have students present their ads via the document camera or the projector depending on which ad they made. Thanks. The links to the sugary beverages website are updated and should be working now. After this lesson, I follow up with the lesson entitled "Water: The Overlooked Nutrient" and an infused water lab. Thank you! That’s a great way to sequence these lessons!